My son had a Harry Potter birthday party, and I whipped up these cupcakes. To make them easier, I went with a design similar to one I’d seen online, where only Harry’s glasses and lightning bolt scar were included. My kid wanted the scar to be red, so I used red gel writing icing. What You Need: 1 cupcake; white frosting tinted “flesh” tone (I added a little Wilton Ivory, but a tiny bit of Copper would also work); red Decorating Gel in a tube; black writing icing or gel (I used Wilton’s Sparkle Gel). How to Make It: After tinting icing, frost cupcake. Use writing gels to draw glasses and a red scar (which goes on the right side of the boy wizard face — your left). No black magic required. 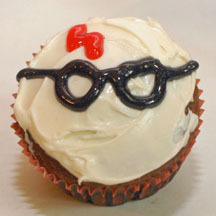 This entry was posted on Monday, October 17th, 2011 at 5:46 pm	and is filed under fantasy and magic cupcakes. You can follow any responses to this entry through the RSS 2.0 feed. Responses are currently closed, but you can trackback from your own site.